The Institute of Memory (TIMe) continues to haunt my own memory of the performance, which marks a pretty good indication of its success artistically. I went with a friend and we barely discussed details afterwards. We jointly agreed this needed digesting. Imagine if you will a life. Not as we imagine a life--or as we all too often imagine one. The beginnings, middles and ends (yes I know I used plurals) are there, some of them known. But answers in many ways elude. Questions remains, forming frankly more of this specific life than we like to dwell upon. What after all can we know about anyone, save what is remembered? By individuals or by recordings one way or another. Medical files. Personal letters. These days the every increasing archive in digital format we all create with each keystroke or mouse click. 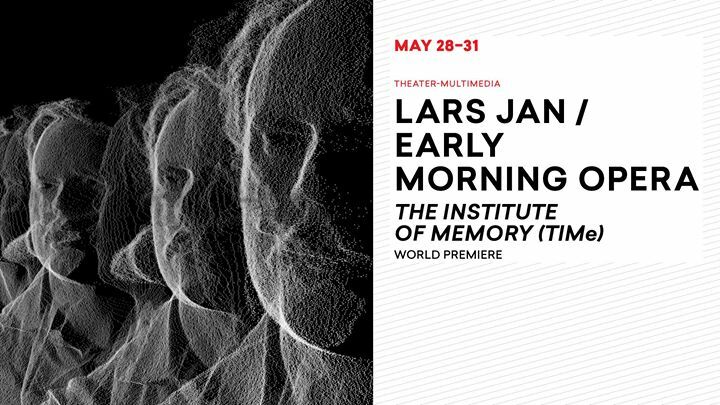 Or this blurb: A multi-dimensional visual design sets the stage for award-winning director and media artist Lars Jan’s theatrical exploration of the blurring of short and long term memories, and how “remembering” is changing now and into the future. 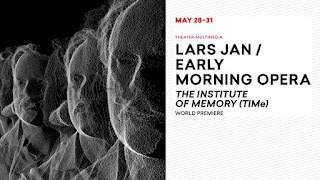 With two performers, high-tech 3D renderings, original music and a collage of found and composed text, TIMe traces the transformation of archives from physical to digital structures, and the corresponding evolution of national and personal remembering and privacy through the story of director Lars Jan’s father — an enigmatic Cold War operative and privacy-obsessed misanthrope. Appropriately enough, this sounds intriguing without really saying much. Appropriate because this show really does capture and enact its central metaphor--our memories remain fluid, unclear, full of insight yet also little finality. In a way we the audience intrude. In another way our entire society intrudes (although frankly this last seems more a minor contemplation along the them rather than anything like a bullet point or nice clear clue). 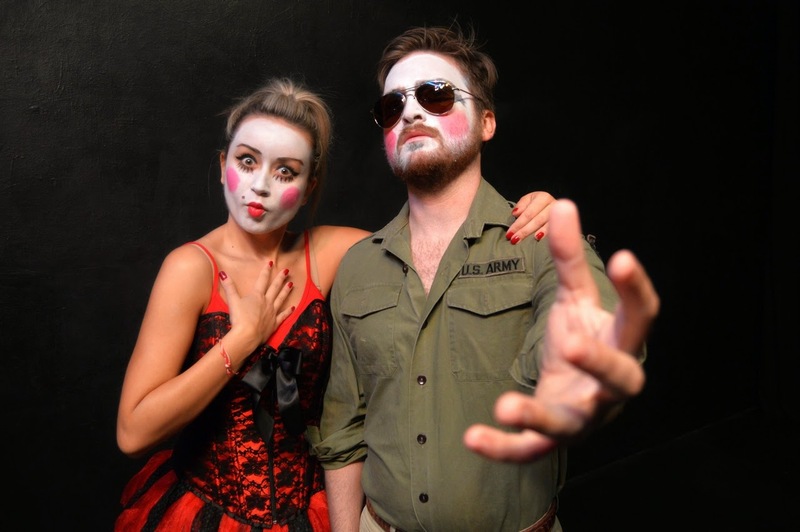 Ryan Masson and Annie Saunders remain on stage for the length of this production from Early Morning Opera. Along the way they become or pretend to be or give voice to a variety of different characters, many of which remain unidentified. Others seem little more than archetypes or the voice of some official documents, such as the medical staff where Henryk Ryniewicz finally ended his days. Presumably. The gentleman in question's paranoia infected me after a time. Here was a man who named his only son "Lars" because he thought it sounded simultaneously German, Russian, Scandinavian, maybe American. A gift for his (presumably) only child--a name that might help him survive World War III and the purges to come. Paranoid? Yes. Oh, yes. But not manic. Nor, as it happens, completely unjustified. The man had seen Poland under Nazi rule. 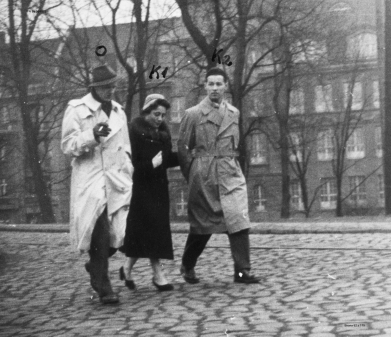 He fell under surveillance of Polish Intelligence during the Soviet Era. He seemed like a difficult man. A sad one. With a real appreciation of little pleasures, like watching his son climb a tree. Or so was the image Masson and Saunders created with the help of multiple designers and technicians bringing to life the real Lars Henrik (note the changed spelling) Jan's writing. In the end I cannot say for certain I understand this piece. Not because it baffled me but due to how deep and complex the subject matter--a single human life, understood and explained as such can only be, via other single human lives with their own agendas. The son. The performer. The audience member. Yet a whole in its own way, one that has made itself part of my life. I am changed. Entranced and frustrated, yes. In almost equal measure. Mind and heart, language and image, Apollo and Dionysus. The Institute of Memory (TIMe) finishes its run at the REDCAT today at 3pm. Another run of performances are scheduled for Portland in September, then in Boston in Winter, 2016. Hopefully more dates shall follow. I cannot but hope more people will share this experience. Moliere is tricky to do. The 17th century French playwright rightly shines as one the greatest comic writers of all time, but the theater of his age was very different from that we know today, and given so much depends on the quality of the translation, many of his works don't get as much 'play.' A shame. 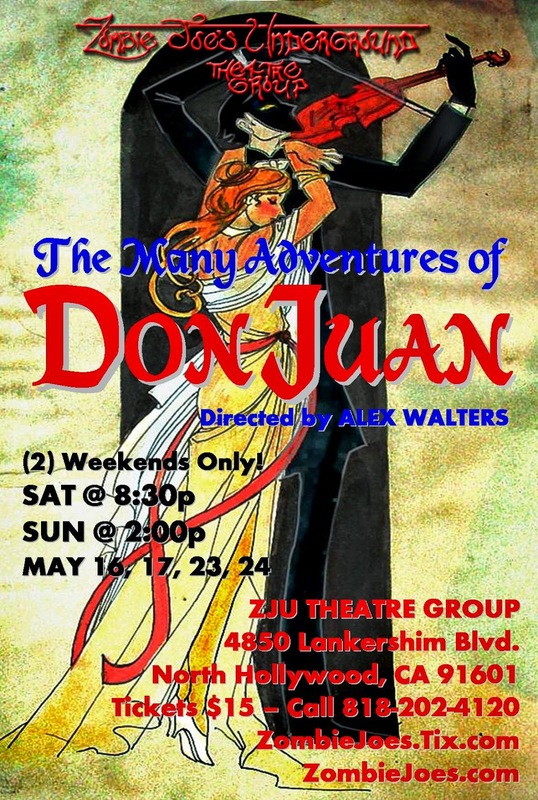 The Many Adventures of Don Juan, one of Moliere's most scandalous works, has one more weekend of a sadly limited run at Zombie Joe's Underground Theatre in North Hollywood. Thankfully, this production gets it spot on! In fact the comic style melds quite nicely with the high-energy, often deeply irreverent style at ZJU. In this case, director Alex Walters creates a madcap, naughty and very funny 'world' that connects between the far-off Europe of three centuries past and our modern America. Don Juan (Robert Walters) is the ultimate womanizing libertine, much to the despair of his silly manservant Sganarelle (Dorian Serna). The nobleman celebrates his seduction and marriage of a nun, Donna Elvira (N.j. Ambonisye), who is furious over her abandonment. He doesn't care, but immediately plots his next crime--the kidnapping of a beautiful newlywed. This one at least doesn't come off as their boat capsizes, leading to some locals to rescue the pair, which in turn gives Don Juan the opportunity to cause a fuss over two different girls he promised to marry--presumably after meeting each the same day! Opera fans (the famous opera has the same source material as the play) might start recognizing some of the classic tale as the famous rake visits the tomb of the Commander (Jason Kaye) killed by Don Juan in the course of a previous escapade. He jokingly insists upon inviting the statue to dinner. When the statue nods his reply, the two flee in terror. Not that Don Juan remains afraid long. He soon asserts all that was nothing but a trick of the light, in time to dazzle with compliments one of his creditors (Irwin Moskowitz) before sending the man on his way, sans payment. about impressive was how I understood every single word spoken! Diction is a pet peeve of mine. 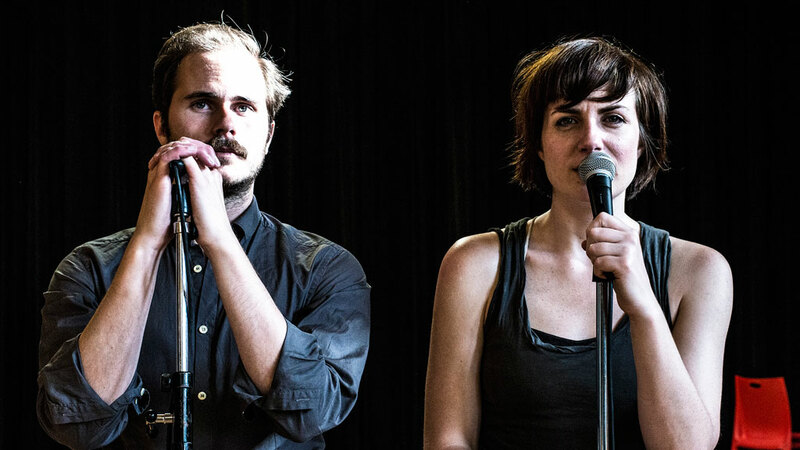 Often even the best shows in Los Angeles (and elsewhere) suffer at least a tiny bit from slurred words or soft consonants so I have to strain to figure out what's said. Not this time! Each and every word ended up clear and sharp! But honestly the whole show proved a tour-de-force for everyone. The whole ensemble including Tara Egnatios, Georgan George, Amy Muszynski and Mariya Pesheva gave it their all and it shows! Even Kevin Van Cott's original music added to the whole dizzying fun of the piece. When you think about it, the subject matter doesn't really seem like it should be funny, does it? Yet I cannot emphasize how much I actually guffawed! 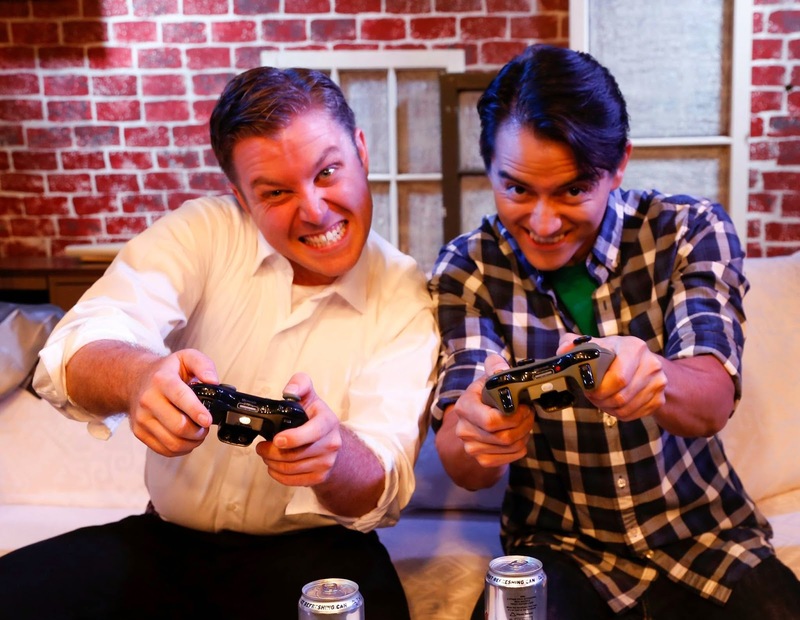 Comedies can be instantly and clearly succeed or fail based on whether they get laughs. For this one, I had a hard time catching my breath sometimes! And a grin hardly ever left my face! 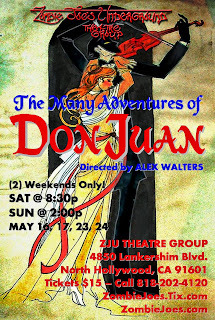 The Many Adventures of Don Juan plays Saturday May 23 at 8:30pm and Sunday May 24 at 3pm at Zombie Joes 4850 Lankershim Blvd. (across from KFC and just south of the NoHo sign), North Hollywood CA 91601. Tickets are $15 and can be purchased at ZombieJoes.Tix.com. Or call (818) 202-4120 for reservations. 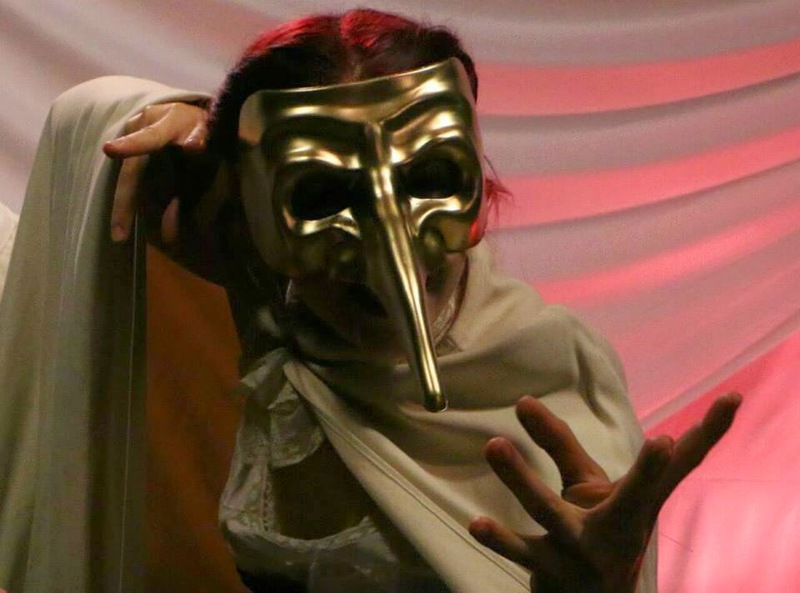 Theatre Unleashed is a company committed to periodically putting on a collection of ten minute plays, as well as really extremely high quality full productions. 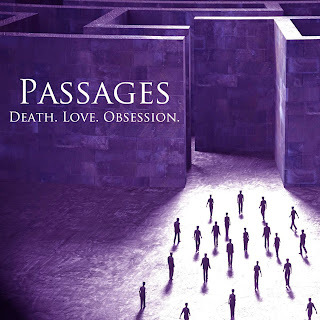 Passages marks their latest such, and it pretty much captures what I like and dislike most about the whole tendency these days to mount such mini-plays. The problem lies in the fact so few ideas can really be sustained and explored adequately in a mere ten minutes. Those that do, most usually end up as little more than funny skits, but rarely receive the kind of rigorous rehearsal effort required to pour so much into so little. elements were there, including some very humanity (as opposed to plot or prop or coincidence)-based humor and genuine charm. But it came across as too short. Mind you Abella also wrote a play TU will be doing for this year's Hollywood Fringe so it looks like we'll get to see what they're really capable next month! 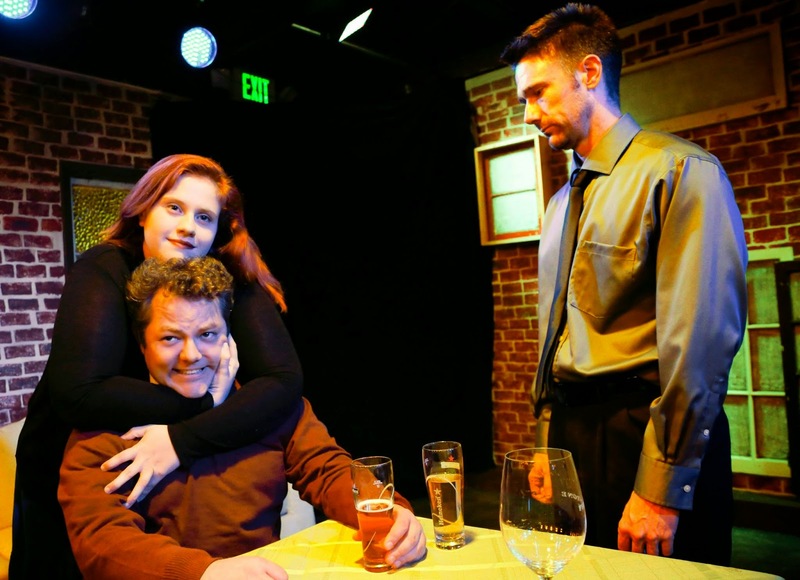 Pretty Face by Jenn Scuderi Crafts, directed by Sammi Lappin, is frankly quite a bit more existential but could easily fit into the ten minutes allotted. But it seemed under-rehearsed. Very much so. With only ten minutes to fill, and two characters, every single note needs to achieve something close to perfection. 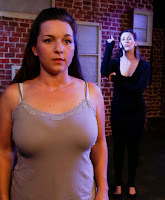 Woman (Kalyna Leigh) and her Reflection (Heather Smith) weren't in perfect physical sync from the start, which made the whole (clever, potentially very moving) piece feel off from the start. And so it proceeded. Lovely idea, with seemingly good performers but they didn't achieve what seemed on the page. Home by Jim Martyka and directed by Jase Lindgren was another that just needed more time. Bill (Paul Thomas Arnold) playing the father slipping into dementia did a fine job, but had a huge advantage--his character literally lives only in the one eternal moment of now. Michelle (Katie May Leo Porter) had to carry and convey the entire history of this relationship, and do it in ten minutes. The playlet doesn't give her enough to do it, not because the writing is poor (far from it!) but there simply isn't the space. It is as if someone reduced a full sonnet into a haiku. 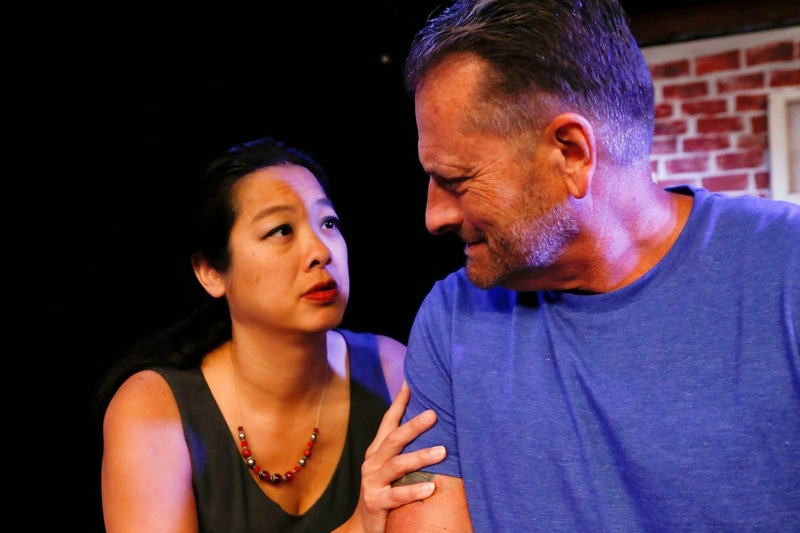 Restless by Bobby McGlynn and directed by Carey Matthews faces this problem even more so, but offers a more tantalizingly wild glimpse of what should be a much longer and more complex play. Theresa Stroll, Graydon Schlichter and Mike Gerbi give us this wild ride of a blind date from (and into) Hell with a dizzying flurry of imagination--but it wasn't enough. Nowhere near. Good Morning Princess by Brandi June and directed by Cameron Stark gives us something of a delicious take on a fairy tale with Margaret Glaccum as a princess who has slept for a hundred years and David Foy Bauer the prince who's come to wake her. This was fun and fit into the format of the ten minutes very nicely indeed--but does feel like a (very good) sketch rather than a play. Like most of the works in this group it makes fir a nice little show, with some clearly talented people performing for you. 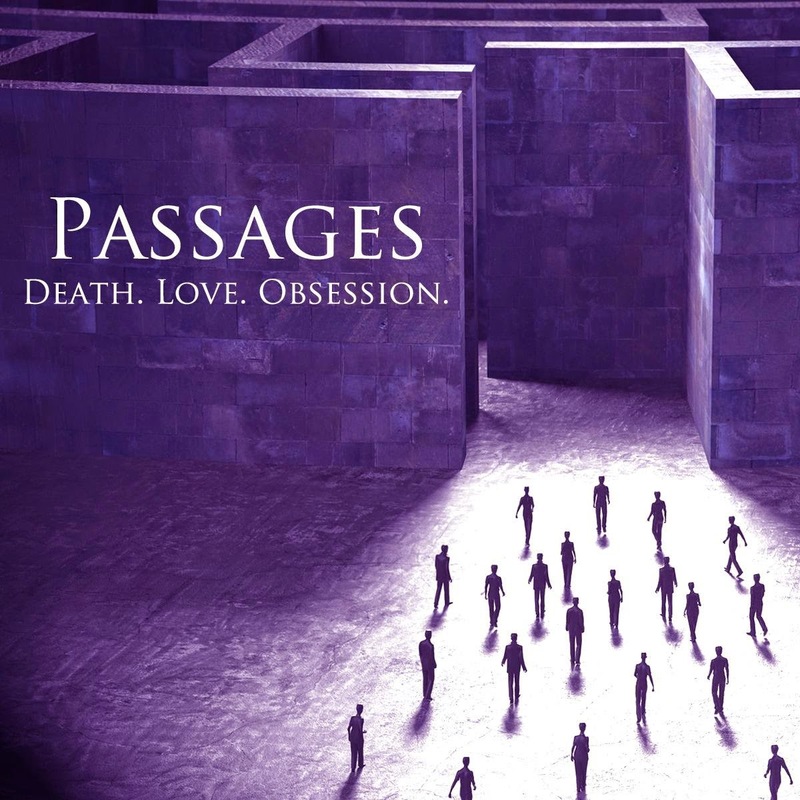 Passages plays at the Belfry Theater at 11031 Camarillo St, North Hollywood, CA 91602 Thursdays through Saturdays at 8pm until May 23, 2015. You can make reservations by calling (818) 849-4039 or clicking HERE. Tickets are $10. Note: I saw but failed to complete my review in time for the previous Ten-Minute Play Showcase by TU, Friends with Penalties, which showed a wider range IMHO. But I apologize for that. 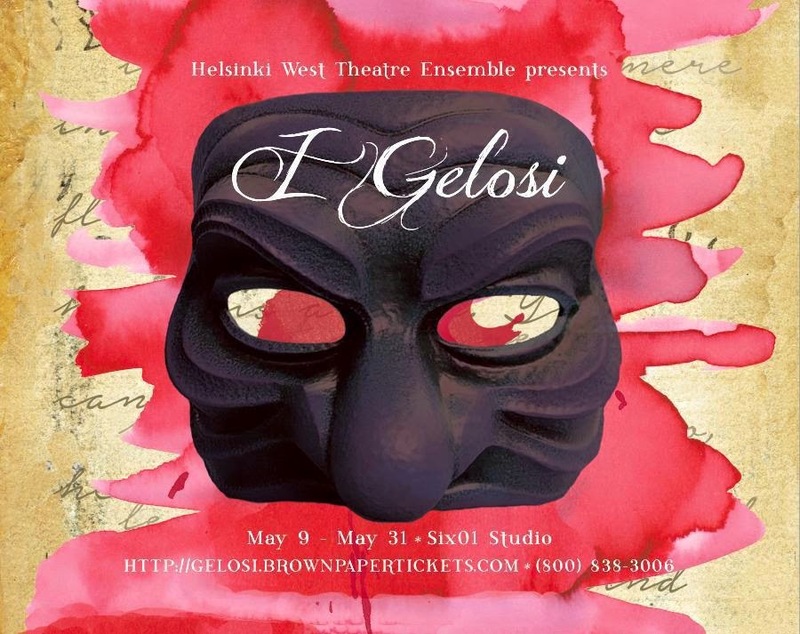 Helsinki West is a new company, and David Bridel's I Gelosi their premiere production. Last year Four Clowns did his Noah and Jonah (which proved amazing). Francesco (Sean McDonaghy) barely eking out a living until the lovely Isabella (Milly Sanders)--a poet and natural actress--joins them, the first actress of the era! Soon they attract a fan in the person of Orazio (Victor Manso) who happens to be the nephew of the Duke of Milan (Richard Garnett)! The Duke offers his sponsorship provided they accept his mistress Vittoria (Kristyn Chalker) into the company. 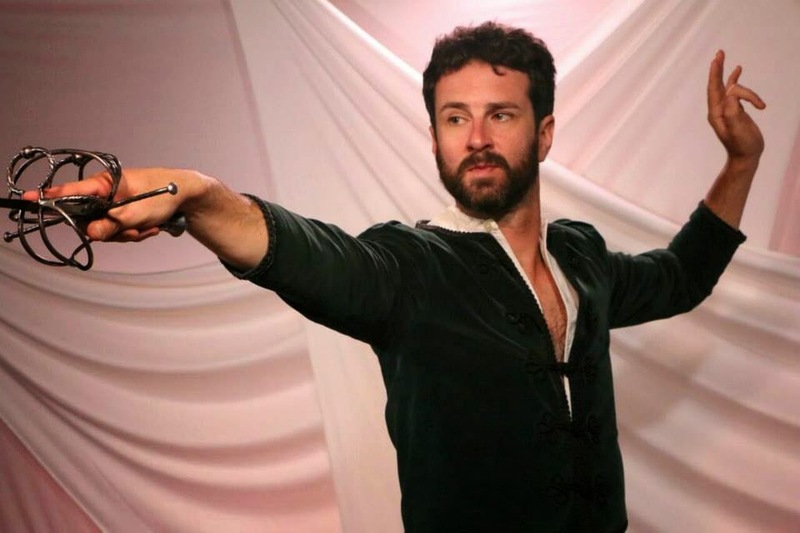 Soon they so impress Charles IX (Alex Choate) they end up invited to the French court, to the less than rapturous approval of the King's mother Catherine De Medici (Ann Levin). On the trip, a former maid named Sylvia (Jessee Foudray) saves their lives and also joins the troupe. In France, Francesco's rage at the powers that be who abandoned him and others in the war motivate him to demand I Gelosi (which means "The Jealous Ones") perform a political satire mocking the Pope. From there, internal debate and emotional as well as artistic agendas begin to tear the group apart. Sounds like a perfectly workable plot, doesn't it? The stuff of an interesting, dramatic, entertaining work, don't you think? It proves much more than that. The script itself for example manages to put us through the emotions of every single member of the troupe, so we totally sympathize and feel total judgment on each one. No small feat, especially since in some ways we dislike more than one of them. More, it isn't simply a matter of what they individually want. What they desire, expressed from the very start, runs virtually the range of human desire. Love. Food. Fame. Revenge. Yet not as written--nor, crucially, as performed--do they once become caricatures or archetypes instead of people. The kind of consistency of this throughout lets me know just how good a director Marjo-Riikka Makela must be, not least because of her casting choices! Also all the details about this show form one cohesive--and let me note as well, beautiful--world for the performance. Costumes by Amanda Maciel Atunes did wonders in suggesting the opulent styles of the period, while the music and sound design by Ellen Burr sucked us into the feel of the Renaissance when kings and dukes and popes wielded enormous power amid an odd glamor as we look back upon it today. 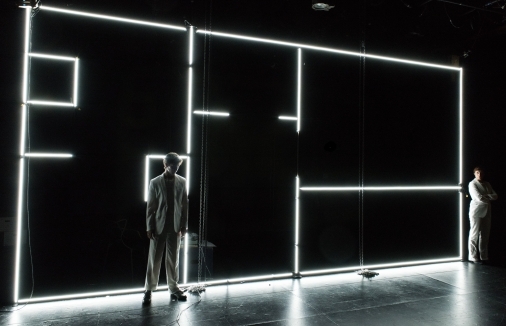 Alex Choate doubled in creating an amazing scenic and lighting design that left me with a distinct feeling theater directors all know too well--space envy. This marks one of the half-dozen best productions I have seen in Los Angeles as well as among the top dozen theatrical productions I have ever enjoyed. Missing this production would count as genuine lost opportunity, to be regretted for years and years. Note: The cast of this production varies night to night, as a true ensemble. I for one am tempted to go see it several more times for that very reason! I Gelosi plays Saturdays and Sundays, 2pm and 8pm, until May 31, 2015 at Studioo Six01, 630 Flower Street Burbank CA 91502. For tickets call (800) 838-3006 or go here. 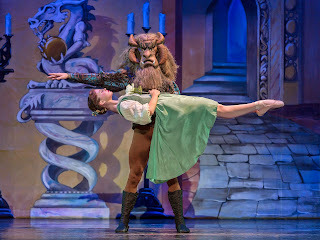 Quick note--this Inland Pacific Ballet's work stems from my favorite fairly tale as a child, Beauty and the Beast. This was of course decades before Disney made their popular version. At the start of the show--well, before, actually--an announcement this version lacked Gaston as well as any talking furniture or cutlery might have spared some disappointment. Almost half the audience when I attended were children--children totally entranced by what they saw. That says a lot. One of the many wonderful yet infuriating things about the very young remains their brutal honesty. If they don't like what they see, they fidget. They talk amongst themselves. They look for ways to have fun. 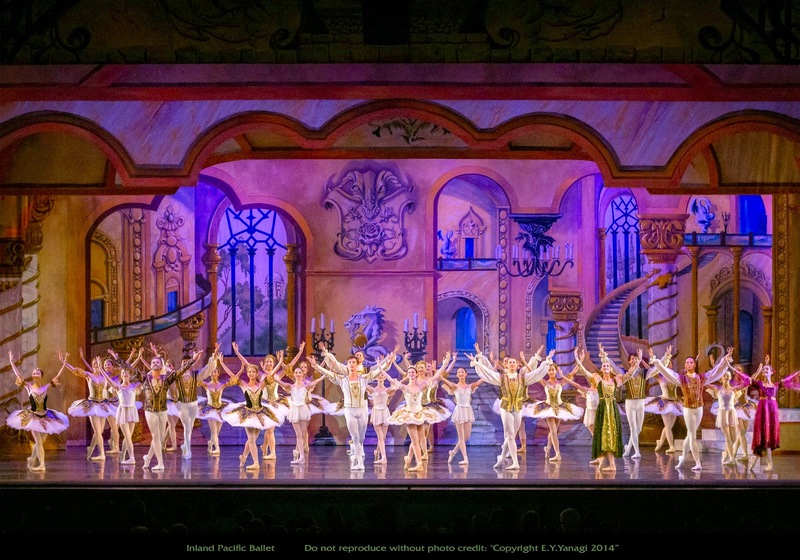 But for this ballet they remained silent, attentive, honestly and wonderfully entertained. I cannot claim any expertise in ballet (although I am a dancer and have taken ballet classes), so perhaps my comments deserve a grain of salt. I found the show quite charming, full of beautiful movements and music, with the story generally very clear. My program explained many details about the plot that were nowhere in evidence on stage. But this seems fine. I always say if you need to explain a piece of dance before anyone sees it how good can the dance be? Yet the details in the program impacted the story not at all. Act One begins in the Beast's garden, where he (Cameron Schwanz) laments his fate. A group of dancers I later learned were supposed to be roses (at the time I thought them fairies--but then fairies showed up later) comfort him until a stranger wanders into the garden, Beauty's Father (Jonathan Sharp). An agreement is reached after the Father dares to pick a white rose--that either Father spend the rest of his life imprisoned here, or he send one of his three daughters instead. In the Village Square, we meet the three daughters--especially the hard-working and popular Beauty (Meilu Zhai), and her two jealous sisters (Miranda Rose and Ashley Mohadjer). When Father returns, he is acting strangely even as he gives the white rose to his favorite daughter. She eventually gets the story out of him, although he refuses under any circumstances to allow her to take his place. Once left alone, rose in hand, she immediately heads into the Enchanted Woods. There she meets with a gaggle of young bewinged fairies who hide at first. 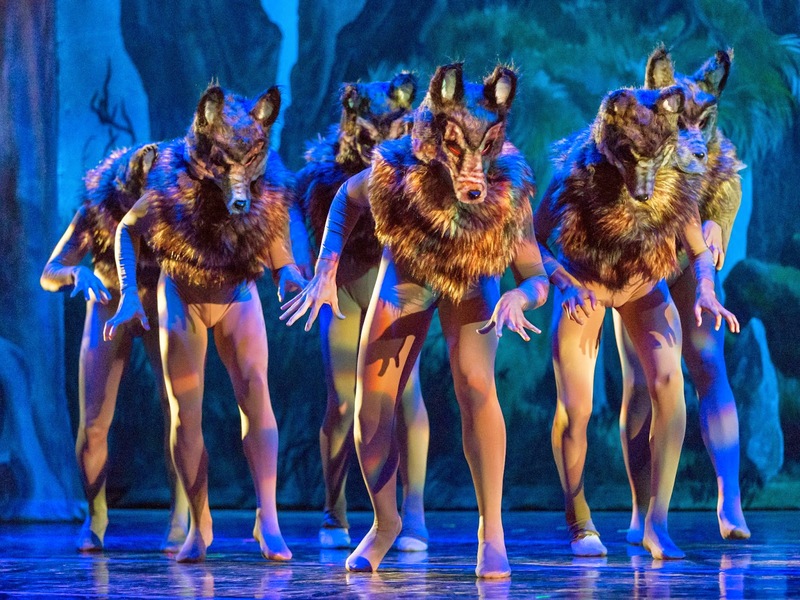 But when they flee, an exhausted Beauty discovers wolves haunt these woods--until the Beast rescues her. Act Two begins in the Beast's palace, where Beauty wakes and meets a small cluster of gnomes. Eventually the two meet and begin a kind of friendship that is also a wooing. Beast asks her to marry him, but she refuses. In time he allows her to visit her family, with the warning that if she does not return he will die. White rose in hand (this prop was used to great effect). Back in her home, Beauty is greeted with great joy, especially by her Father who up until now has been depressed and slowly becoming sick. Only when Beauty gazes into the rose, seeing a vision of the slowly dying Beast, does she suddenly leave home. She finds Beast in the garden, sick. When he asks her to marry him one more time, she agrees, and he magically transforms into a handsome prince. Smiling, the two are led off stage by the fairies. Now, I really enjoyed the show up until this moment. Far more than I expected. The dancing and acting and through-line of it all delighted me. I also felt startled and amazed to see the music was not from a specific ballet for this story but woven together to form a new piece! I could feel myself smiling, taking in all the lovely details of the dancing as well as costumes and set and everything. But to be honest I didn't see any reason for the last scene which was evidently everybody getting to move into the palace and wear gold and white then dance their little hearts' out. That felt 'off' but then maybe this is a rock-hard tradition of the form? More importantly, it does nothing to prevent my recommending this lovely show. 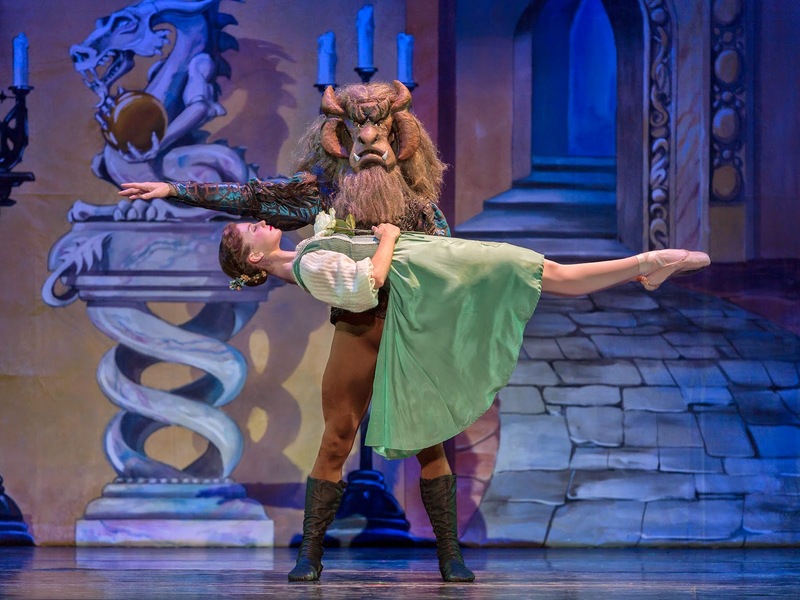 Beauty and the Beast has two performances left at the Fox Performing Arts Center 3801 Mission Inn Avenue, Riverside, California 92501 the weekend of May 15-16, 2015. I have initiated moderation on my blog. More, I will not even consider allowing any comment from any anonymous source. That is all.